Product: Please Choose OneStemless WineWater Bottle Color: Pleaes Choose One Navy Blue-BothHydrangea-bothRed-BothOcean-Stemless Only Personalization: Please Choose OneNoneSingle InitialMonogramName Initial, Monogram, or Name: Font Type: Please Choose OneNoneBlockScriptStacked (monogram)Script MonogramFishtail Vinyl Color: Please Choose OneNoneRedPinkWhitePebbleBlueBlack Who is this item for? Take a Swig in style with our super popular 9oz Insulated Stemless Wine Cup! 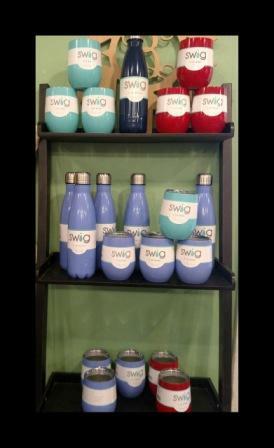 Swig Vacuum Insulated technology will keep your white wine the perfect kind of cold while you sit out at the pool on a hot summer day, or your coffee hot if you need just one little steamy cup of joe to start your day off right. 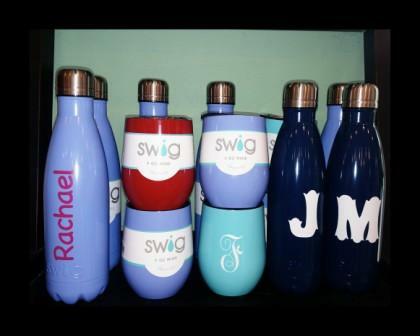 These beauties can hold up to 12oz, so when you fill it up that's two standard glasses of wine! • Vacuum Insulated • Cold up to 24 hours and hot up to 12 • 304 Grade - 18/8 Stainless Steel • Vacuum Sealed Stainless Steel Cap • Copper Coated Inner Walls • Sweat Free • Water Bottle Holds 17oz and fits most standard cup holders, Stemless wine holds 9-12oz.